We were definitely not bitter or resentful in any way. Why would we be? We never ask why God would allow this to happen to us. He often allows hard things to happen to His people, so why not us? Job was the most righteous person on the planet, and look what he went through. Both of my parents had cancer, as did my best friend from childhood, Jerry Hardin, and we’ve known many others who've had it. Were we surprised by the cancer diagnosis? Yes, in the sense that, like most people, we didn’t see it coming—though Nanci had a lot of pain over an eighteen-month period, due to an undiagnosed hiatal hernia, and there were times when she wondered whether she had cancer or something else since there was clearly something wrong with her body. It turned out that the pain had nothing to do with the colon cancer, though cancer was discovered while trying to figure out the cause. So trials are a normal part of life, but when something as serious as this comes on, all of a sudden your life doesn’t seem normal anymore. I appreciate how J. B. Phillips translates James 1:2-4: “When all kinds of trials and temptations crowd into your lives, my brothers, don’t resent them as intruders, but welcome them as friends! Realize that they come to test your faith and to produce in you the quality of endurance. But let the process go on until that endurance is fully developed.” It’s not easy to welcome difficulties instead of resenting them, but Nanci and I are trusting that God tells the truth when He says they can increase our endurance, expand our ministry, and prepare us for eternal joy. What lessons has the Lord been teaching you both over the last several months? Even in the midst of doctor visits and rounds of chemo, Nanci and I have been delighting in God through delighting in His Word, and have been discussing His faithfulness and aspects of His character. This has been an anchor for us. Jesus is the object of our faith and the source of our eternal perspective and present comfort. Nanci has also loved reading Knowing God by J. I. Packer and Trusting God by Jerry Bridges, along with A. W. Tozer’s The Knowledge of the Holy. Both of us highly recommend these books, because they center us on the person of God which is where we all need to set our minds, whether we’re facing cancer or anything else. Our hearts have been lifted in praise as we contemplate His holiness, grace, justice, mercy, and every facet of His being revealed to us in Scripture. As much as we appreciate the physicians and the advances of medical science, we are reminded that our ultimate hope is not in them but in God. Trust in our sovereign and gracious and happy God, who alone is sufficient to bear the weight of our trust, allows Nanci and me to laugh and talk and pray together each night with an underlying foundation of happiness. We are secure in God's love and fully trust Him to do what He determines is best for His glory and for Nanci’s good. Scripture tells us, “Our God is in the heavens; he does all that he pleases” (Psalm 115:3). Nanci has said the Lord has been teaching her about waiting on Him. Can you share more about that? We all find ourselves in situations at times where we desperately want to do something to fix, change, or even escape our circumstances. We are in fact willing to do anything that God leads us to do, but He seems to be placing us in holding patterns. We want Him to work, but He appears to be waiting to do so. “Waiting” is an enormous tool that God uses in our hearts and to accomplish His purposes. In the “waiting,” He is working. How has cancer impacted your marriage relationship? Nanci and I are treasuring our relationship more than ever. We are taking it one day at a time, and though it has affected our routines, we are seeking not to let the cancer define our lives. It is a new season and a new calling with new opportunities and new people to minister to. We are loving God and each other and our family and friends. I’ve had the privilege of being her caregiver for the first extended period in our lives. She’s always been there for me and served me, and I’ve sought to serve her too, but I’ve never had more opportunity than in these last ten months. It’s been a privilege. What verses from Scripture have been especially meaningful to you during this time? I have also been finding great joy and comfort in the Psalms: “The LORD is my rock and my fortress and my deliverer, my God, my rock, in whom I take refuge, my shield, and the horn of my salvation, my stronghold” (Psalm 18:2). “Those who know your name trust in you, for you, Lord, have never forsaken those who seek you” (Psalm 9:10). “Praise the LORD! Oh give thanks to the LORD, for He is good; For His lovingkindness is everlasting” (Psalm 106:1). I am convinced that nothing can ever separate us from God’s love. Neither death nor life, neither angels nor demons neither our fears for today nor our worries about tomorrow—not even the powers of hell can separate us from God’s love. No power in the sky above or in the earth below—indeed, nothing in all creation will ever be able to separate us from the love of God that is revealed in Christ Jesus our Lord (NLT). It’s been sad for me to see Nanci have a rough time with fatigue and neuropathy and pain after her treatments. Like her, I find myself clinging to and rejoicing in God’s goodness: “Taste and see how good the LORD is! The one who takes refuge in him is truly happy!” (Psalm 34:8, CEB). Not every day is easy for her, but I’m very proud of her for keeping her focus on our Lord and maintaining a sweet, cheerful, and trusting spirit. She is a great example to me, and we are in this together. Nanci is my beloved soulmate and closest friend, so naturally this is hard for me. Not because I don’t trust God, but because I know that His plans are not always ours (which of course is good, but doesn’t always feel that way). And while we still pray fervently for Nanci’s healing, we can’t just “claim healing” and get exactly what we want, the way we want it, in the time we want it. Of course we still ask Him freely for all that, and will delight in every answer we see. In fact, God may have healed Nanci last spring when we gathered with our pastors and former pastors and wives and they prayed over her and anointed her with oil. (We were told that tests couldn’t prove anything at that point.) We trust Him and His purposes, and ask Him for strength to honor Him in a spirit of trust and joy. We’ve seen God at work in us, helping us to grow closer to Him and each other. Our daughters Angela and Karina have been very involved and helpful with their mom. We have witnessed friends from our church and several others rise up in prayer and service. It’s been my privilege to serve her. For all this we’re deeply thankful. 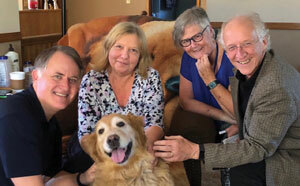 We talk a lot about the Lord and our family and great memories, and we watch football (therapy for Nanci) and enjoy Maggie, our therapy dog (an unofficial title). We seek to thank God for every blessing, of which there are many. How has having an eternal perspective helped? Over the years, Nanci and I have talked a lot about our mortality—not in any morbid way, but just simply recognizing that at some point we’re going to die. Some families don’t even mention that or bring it up, but it’s true whether or not we acknowledge it. We’re very aware of the fact that we only have so much time in this world, so I think having an eternal perspective really has helped us as we talk about wanting to finish well. We both have a very well developed doctrine of Heaven, the resurrection, and life on the New Earth. On our toughest days, it helps to remember that we have not passed our peaks physically or mentally—the resurrection and eternal health of body and mind awaits us! Nanci and I want to express again our heartfelt thanks for your prayers. We wish we could personally thank every person for every kind word or action or prayer, but that isn’t possible. The words “thank you” are on our lips more than ever, both to God and to the people through whom He touches us. We are well aware that many of you reading this are facing difficult challenges, some considerably more difficult than ours. This humbles us, and we thank Him often for your friendship and prayers and hope you too can sense His nearness to you. “For the eyes of the LORD move to and fro throughout the earth that He may strongly support those whose heart is completely His” (2 Chronicles 16:9). Our Lord is always present and will never abandon His children: “God has said, “Never will I leave you; never will I forsake you” (Hebrews 13:5, NIV). Follow Randy’s updates on CaringBridge for the latest on Nanci's health. Stephanie's thoughts about her experience with cancer will help young and old alike. Coming off Nanci’s and my “year of cancer” in 2018, I encourage everyone to read this article and pass it on to others!